Though the second-ever Tarnanthi festival of contemporary Aboriginal and Torres Strait Islander art has been brought together by one woman, it speaks with many voices. Picture the first flicker of sunrise, or the sight of a sprouting seed. ‘Tarnanthi’ means both of these things. “It’s about new beginnings,” says Nici Cumpston. She honours the Kaurna word by shedding light on contemporary Aboriginal and Torres Strait Islander art. As artistic director of TARNANTHI festival, Nici worked with Kaurna Warra Karrpanthi – a group of elders and community members who speak the language – to translate the fertile word ahead of the inaugural event in 2015. Two years on, this collaborative attitude continues to inform Nici’s curatorial choices. Her second festival is brimming with the results of her broad engagement: the program showcases more than a thousand artists from different language groups across the country. And this year’s city-wide iteration of TARNANTHI speaks to the diversity of contemporary Indigenous art, encompassing painting, installation, screen printing, photography, moving image, sound works and more. 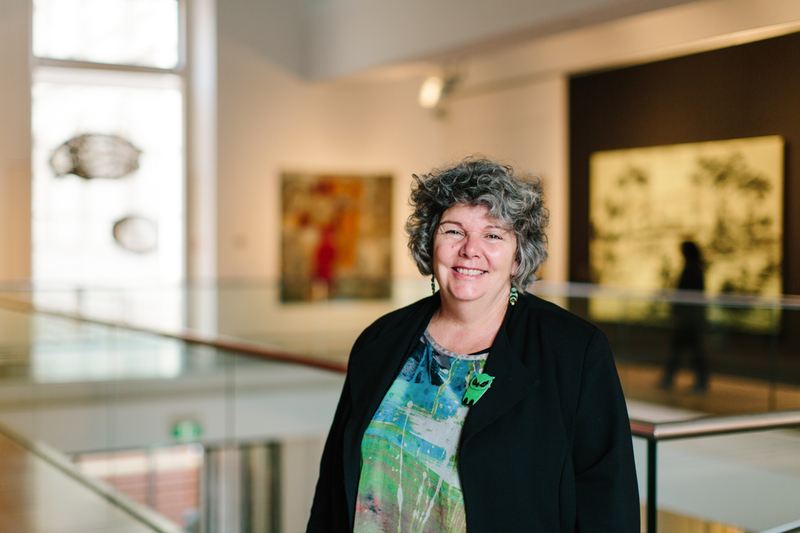 “I work by talking to people, find out what they’re working on,” says Nici, herself a Barkindji artist and curator based at the Art Gallery of South Australia (AGSA). TARNANTHI takes place October 13-22 throughout the city, and some works from the Festival will be on display at the Art Gallery of South Australia from October 13 to January 28, 2018. The program represents over forty arts centres from Australia’s width and breadth. That said, Nici has “given a strong voice” to those hailing from South Australia’s own desert doorstep: the Anangu, Pitjantjatjara and Yankunytjatjara (APY) lands. As the cornerstone of this year’s festival, artists from the APY region have produced several enormous works for installation at AGSA. “The size is larger than anything I’ve seen,” says Nici, referring to two paintings on repurposed canvas mailbags, both stretched to three metres by five. Twenty-one men collaborated on one work, twenty-four women on the other, with contributions spanning seven communities – Pukatja, Amata, Mimili, Indulkana, Nyapari, Fregon and Kalka – all from the far northwest of SA. “I’ve never seen more than two men collaborate on a painting, so this is a significant statement,” says Nici. “It’s the first time they’ve collaborated across communities. The men came together to honour this time they’re currently living in, and the importance of collectively telling their story. “At the beginning, they sat down and said, ‘This is a really important moment. Before we know it, some of us will no longer be here to share this information.’ So to honour the men who are no longer with them, they’ve made spears and spear throwers. They’ll be laid out in front of the painting as a memorial,” Nici says. The women’s painting depicts kungkarangkalpa – the Seven Sisters ancestral creation story that references the star cluster Pleiades, which becomes the sisters’ final destination when fleeing from a ‘cheeky man’. He in turn leaves the terrestrial landscape, taking the form of constellation Orion. Recording and sharing cultural knowledge is integral to the works, which were created for the artists’ families and communities to draw on. The paintings also provide insight for the wider public, encouraging audiences “to understand the importance of [the artists’] lives and their connection to their country,” Nici says. “I feel honoured to work this closely with artists. It’s their stories, their ideas. It’s been terrific to see the ideas that have come since the last TARNANTHI. Every step of the way, it’s giving people more confidence to push,” she says. Fortunately, Adelaide is an ideal spot for a focal festival that does something unique.